I’m on vacation this week, so my typewriter monkeys are handling all blog updates from September 23 to September 27. Blame them for any mishaps. If I get Internet access at any point this week, I’ll be sure to check in! Relationships are hard. Growing up is hard. Life is hard. Just ask Scott Pilgrim. He’s a Canadian slacker, twenty-three years old, “between jobs,” mooching off his roommate, dating a high school student and doing his best to maintain his precious little life. Then a mysterious girl rollerblades into his dreams, and people start attacking him with swords, and things get complicated. I’d been meaning to read Scott Pilgrim, a graphic novel series, for some time. My search at the local library yielded all six volumes. Was it worth it? Heck yeah, it was worth it. Scott Pilgrim begins in a very ordinary way: Scott lives an average life in an average city with average friends. Then, little by little, almost imperceptibly, things get weird. A girl skates through Scott’s dreams because they’re a handy shortcut on her route delivering packages. A man crashes through the ceiling and challenges him to a duel. Before long, Scott is picking up video game-style extra lives and fighting guys with katanas, all to defeat his new girlfriend’s seven evil exes. The Scott Pilgrim books are steeped in magic realism, a literary style that combines ordinary stories with surreal details—in this case, video game tropes. Scott and his friends take for granted this bizarre blend of video games and real life. As far as they’re concerned, robots and psychic powers are no more surprising than cars or libraries. This weird, wonderful blend of mundane and fantastic is probably my favorite thing about Scott Pilgrim. I was also taken aback by how compelling the story turns out to be. The early volumes of Scott Pilgrim aren’t particularly deep, but the last two take a surprisingly compelling turn. The books may not seem serious at first, yet they have meaningful things to say about the importance of growing up and learning to take responsibility. Even some of the story’s most ridiculous elements can be interpreted symbolically… or not, depending on how seriously you choose to view them. Besides being unexpectedly meaningful, Scott Pilgrim is often hilarious. Characters occasionally allude to previous events in the story by referring to the volume in which they took place. A villain develops psychic powers because of his vegan lifestyle. Scott’s fights are taken for granted by his friends; at one point, they chat calmly about their lives as Scott struggles for his life in the background against a stubborn opponent. Scott himself, despite being insecure and cowardly, is an inexplicably gifted martial artist. (Someone calls him “the best fighter in the province.”) He’s also a self-centered loser. His faults are played for laughs early on, later becoming a serious part of his character’s development. Scott Pilgrim is, appropriately enough, a pilgrimage: the journey of an irresponsible jerk toward being a decent person. I should note that Scott Pilgrim has a 13+ rating, the graphic novel equivalent of PG-13, and it earns every bit of it. Characters smoke, drink, curse, treat sexuality with casual abandon and insult each other mercilessly. Hardly anyone—least of all Scott himself—acts respectfully or responsibly. To put it simply, most of the characters in Scott Pilgrim are terrible role models. The books contain no shockingly offensive material, but sensitive readers may want to give them a miss. 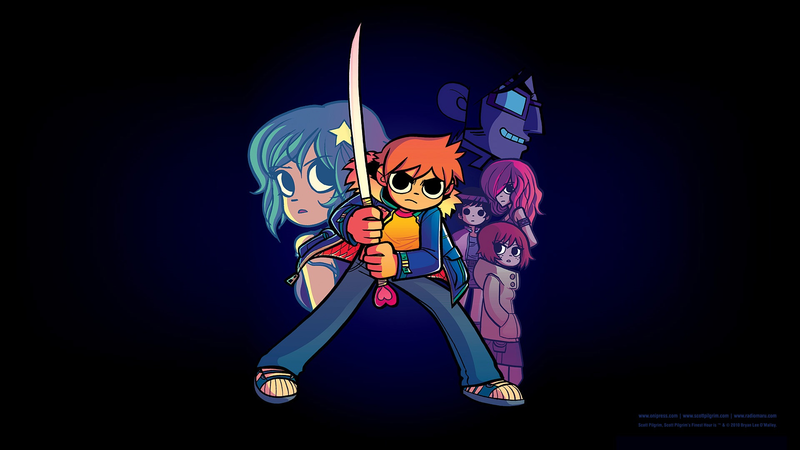 In spite of its moral shortcomings, Scott Pilgrim is a marvelously unique, gloriously silly, unexpectedly compelling series. I recommend it. This entry was posted in Literature, Video Games and tagged book review, geeky, typewriter monkeys by Adam Stück. Bookmark the permalink.